A 14-Year-Old Oil Spill In The Gulf That No One Can Stop In the Gulf of Mexico, an oil spill triggered by a powerful hurricane has been leaking for more than 14 years with no solution in sight. The federal government is stepping in to try and contain it. The National Oceanic and Atmospheric Administration and the Bureau of Safety and Environmental Enforcement are using Ian MacDonald's data to estimate the amount of oil being spilled at the Taylor Energy site. The Coast Guard has just begun to intervene to try and clean up this spill. But it faces challenges. And MacDonald sees the spill as a warning for regulators, just as the Trump administration pushes to expand offshore oil drilling in the Atlantic. The spill began in 2004, when Hurricane Ivan toppled an oil rig into the Gulf. The rig was owned by Taylor Energy, a New Orleans-based company, which managed to plug some of the 25 broken pipes, but the leak continued. Jonathan Henderson runs an environmental nonprofit called Vanishing Earth and worries about the impact on marine life. 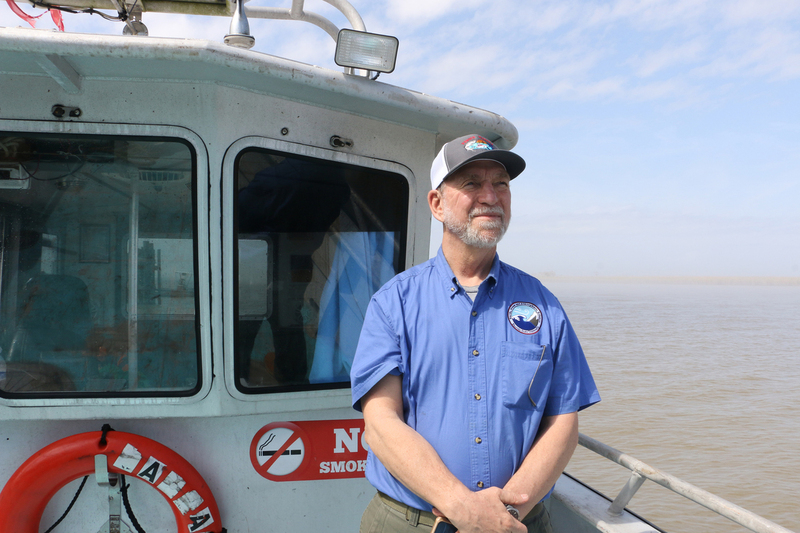 "Everything that lives and breathes in the Gulf of Mexico travels back and forth through that zone," he says. "Fish, seabirds, turtles, dolphins." Everything that lives and breathes in the Gulf of Mexico travels back and forth through that zone. The government is studying the impact on marine life, but even they can't figure out exactly how much oil is leaking. Neither can the company. Henderson has been trying to monitor it himself by doing regular flyovers and reporting what he sees. He's frustrated at the government's response. "If we can put a man on the moon, we can figure out how to, like, grab oil that's coming up from the seafloor and 400 feet of water," he says. The Department of the Interior and the Coast Guard have been working with the company to try to stop the leak for years, but it poses a major engineering challenge. The wells were buried under hundreds of feet of mud in an underwater mudslide, which are common in the area, where the mouth of the Mississippi has built up hundreds of feet of silt on the bottom of the ocean floor. "This is a well-known, high-risk area," says Ed Richards, a law professor at Louisiana State University. He says it raises questions about offshore development. "Should they have built the rig the way they built it? Should it have been permitted that way?" 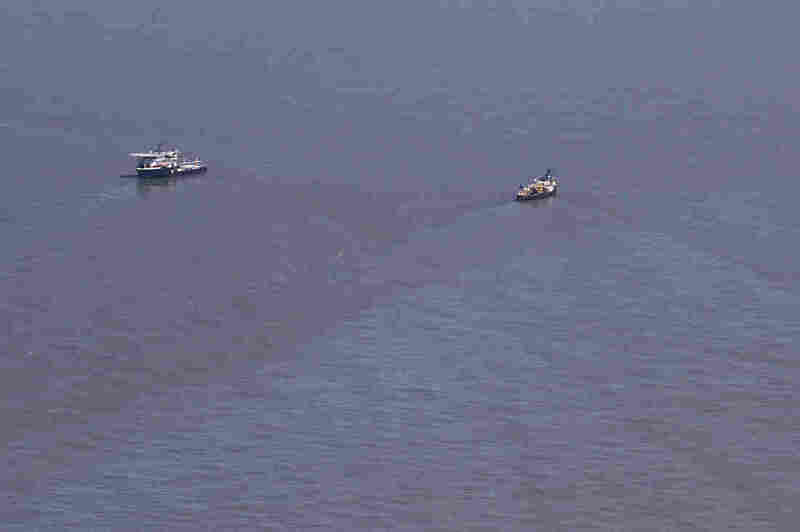 Taylor Energy has spent about $500 million to try to stop the spill, and it's paying for pilots to fly over and monitor it. The company has reported less than a barrel of oil a day on the surface, but estimates vary widely. 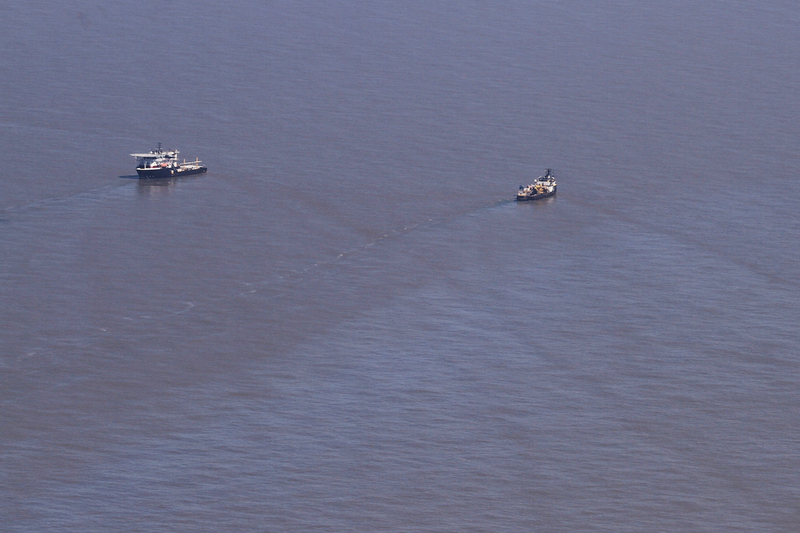 Contractors hired by the Coast Guard survey the Taylor Energy leak in March 2019. Ian MacDonald visits the site of the Taylor Energy oil spill regularly. He's helping measure the size of the spill for the government. He estimates that about 100 barrels of oil are spilling into the Gulf each day, what he calls a sobering finding, "and neither the government nor the responsible parties have been able to stop it, or even acknowledge that it really existed until now." MacDonald says the situation should serve as a warning to regulators as they attempt to expand oil and gas drilling in the Atlantic, where underwater canyons pose a threat to underwater infrastructure. "The idea that we would be building in deep water, and making pipelines going back to land in an area that's susceptible to those kinds of accidents," he says, "is something that we should take into account as we do our planning." But he worries that's not happening. The Trump administration has rolled back offshore safety rules, even as it works to open up more areas to drilling. Earlier this year, the Coast Guard began hiring contractors to try to stop the spill by dropping a giant metal containment dome over the wells in order to collect the leaking oil. Taylor Energy says this could make the leak worse, so it has sued the Coast Guard. Neither the government nor the company agreed to go on record, saying litigation is ongoing. Back on the boat in the Gulf, MacDonald remains hopeful. "I'm really glad to be out here and to see this operation," he says, " because it's been a long time coming, and there's a lot riding on it." But he says it might be that no one is able to stop the oil from bubbling up into the Gulf. If that's the case, according to government estimates, the leak could go on for 100 more years.